Expression... Webster's defines it as a look, an outward aspect. It also states it is the combination of the features of the face showing the feelings. I think this definition is what I strive to accomplish in my portrait sessions. Taking the elements of the face viewed as a whole, capturing the mood and feelings and immortalizing that look for all to enjoy for generations to come. That is the essence of portrait photography-----expression brought to light. Whether it is the pensive look of a classic studio portrayal, the radiance of a beautiful natural light look or the frivolity of an outside, lifestyle portrait, we endeavor to deliver the highest quality images possible. In addition, we try to make your time here an extremely pleasant occasion where "service with a smile" is not just a usable slogan. To ensure the delivery of your quality portraiture, we have a 100% ironclad satisfaction guarantee on all of our work.... Period. Thank you for visiting our website, enjoy viewing the gallery images and please call or email us with any questions, comments or special requests. We are located at 314 South Tenth Street in Opelika and we are open Tuesday through Friday 9:30 til 5:30. Our phone number is (334) 745-2334 or (888) 745-2334. From Auburn (by way of Opelika Road)- Go east on Opelika Road, go past Hwy 280 intersection, past East Alabama Medical Center, over bridge, take a right at the first traffic light after bridge which puts you on 10th Street. Go south on 10th. St. We are at the third traffic light on the left (green house on the corner of 10th. St. and Ave. C.). From Auburn or Montgomery (by way of Interstate 85)- Go north on I-85, get off at Exit 60 (Hurtsboro), take right at stop sign, go under interstate, we are at the third traffic light on the right (.9 mile from stop sign at interstate). From Birmingham, Dadeville, etc.- go south on Hwy 280, take left at intersection of 280 and Pepperell Pkwy. 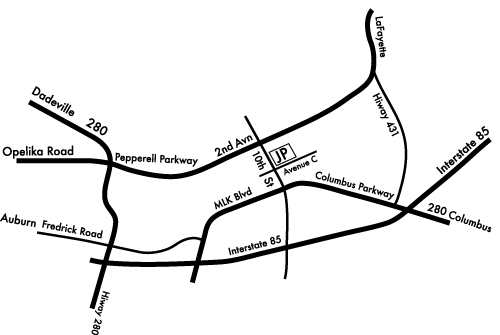 (Golden Corral & Outback),follow directions above (From Auburn by way of Opelika Road). From Roanoke, Lafayette- go south on Hwy. 431, go past Southern Union State Community College, veer right at traffic light onto Samford Ave.,take left at third traffic light onto 10th. St., we are at the third traffic light on the left (green house on the corner of 10th. St. and Ave. C.). From Columbus- Stay on Hwy. 280 to interstate, go over interstate and stay straight (road becomes Columbus Pkwy. ), take right at third traffic light onto 10th. St., go to next traffic light- we are on the corner on the right (green house ,corner of 10th. St. and Ave. C.). From Atlanta, Newnan, Lagrange- go south on I-85, take exit 62, turn right onto Columbus Pkwy., follow directions above (From Columbus).